NABSQNO 12S-585548-4161898. 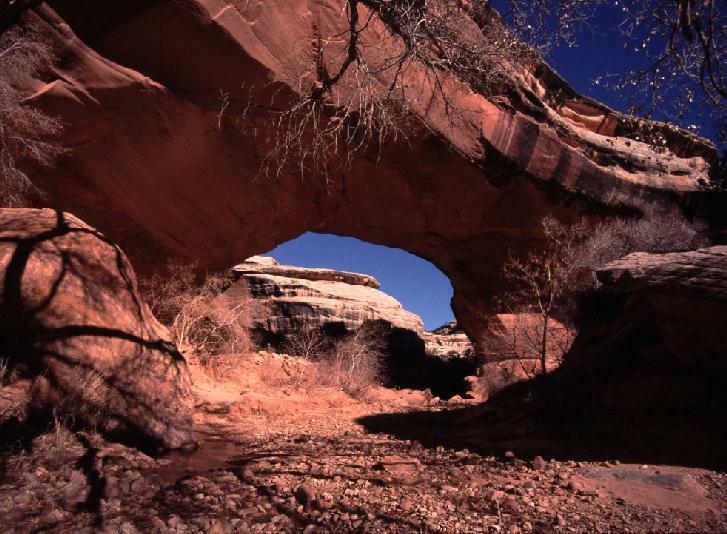 Kachina Natural Bridge is an adult meander natural bridge cut through Cedar Mesa Sandstone by White Canyon Creek. The opening, a classic semicircular aperture, penetrates the neck of a meander just upstream of the juncture of White Canyon with Armstrong Canyon. It is considered adult because the western abutment has retreated from the stream that flows underneath the arch. Indeed, recently documented rockfalls from this end of the lintel demonstrate that the opening is still actively growing. Kachina Natural Bridge is the westernmost of three large meander natural bridges found in Natural Bridges National Monument in San Juan County, Utah. The other two giants in the monument, Sipapu Natural Bridge and Owachamo Natural Bridge, are also excellent examples of meander natural bridges. Owachamo Natural Bridge is a rare example of an old meander natural bridge (see list below). Kachina Natural Bridge can be seen (poorly) from the paved park loop road, or can be reached by a mildly strenuous hike of about a half mile from a marked parking lot on that road. With a span of 192 feet, it is one of the largest natural arches in the world. © 2003 by Jay H. Wilbur, All Rights Reserved.